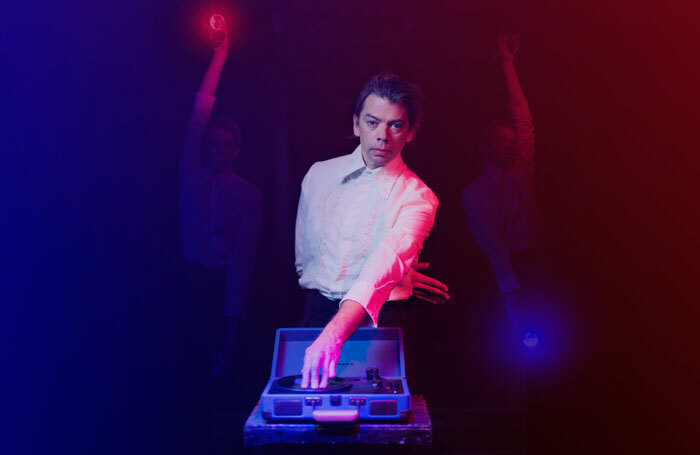 Messages from the other side: Tom Marshman’s solo show summons the spirits of men persecuted for being gay in 1950s Britain. How do you make a show about people you know almost nothing about? About an aspect of their lives, of themselves, which they had to keep hidden? Tom Marshman’s A Haunted Existence is, on one level, the telling of the story of the events which started on a train in the early 1950s, when the arrest of one 17 year old lead to the charging of seventeen more people for homosexuality. It is a show about those men. There can be a discomfort (for me at least) around the telling of recently historical lives – what assumptions are we making? How would these people feel about how they are depicted? How can we look after their stories when they can’t tell us how well we’re doing? When Marshman talks about the facts of the case he does just that – talks about the facts. While a couple of songs and speeches delve more into what these men may have felt or thought, there is little elaboration from historical record. And despite thorough research and investigation, these records are sparse. So what fills up the space between them? On one level Marshman’s performance is less a telling, and more a séance, a summoning. He certainly has the setting for it. A gauze sections off the front of the stage, and the space behind it stretches out into the darkness, only a glimpse given of a strange chart on a music stand. And this gauze hangs in a former police cell, now converted into arts space The Island. When we enter there are three record players sitting on a desk. The middle one spins but no music plays. Projection and needles scratching on vinyl – it seems like the perfect place to sense a ghost. And Marshman has practice as well – he describes in the show an actual séance a psychic friend of his conducted, trying to contact the men the show is about. Marshman is the kind of medium who is chatty one minute, mystical the next. The show buffets between our world and some other. As with a séance, the show is most persuasive when at its most abstract. Facts or direct imaginings about the accused serve to remind us all we don’t know, all we can’t guess, and anchor us firmly to our present; arms raised and feet suspended upside down in the air and rooms of moths and politicians possessing Marshman’s body feel like they begin to make contact, if not with the men themselves, with something else. For after all in this séance, the men are not (only) the spirits, but the medium, the psychic, the Ouija board, the crystal ball. Their stories are used as a physic focus through which Marshman tries to summon other spirits; the Spirit of What Has Changed, the Spirit of Fear and Defiance, the Spirit of Dangerous Words and Dangerous Actions, the Spirit of a Haunted Existence. Does it make it more appropriate in our ignorance of them that the show isn’t really (can’t really) be about them? Are we using their memories, their stories, in a way they would approve of? Marshman does eventually get a message through from the other side – Australia, at least. An email reply from the bowls club where Geoffrey, the original 17 year old who was arrested, and his partner spent their time in their old age. And suddenly the barrier between worlds seems strangely chipped in more ways than one. A bridge has been built between the 1950s and 2018, and that bridge is the human life span. The people caught up in an event which seems so strange and distant become people in our world. Geoffrey died in 1995 but I realise that others of the accused – 17 or 19 at the time – could easily now be in their 80s, could still live in the area. I wonder even more what they would think if they came to see the show. This is possibly the most affecting moment of the performance – even more than when Marshman talks about how homosexuality is still persecuted around the world. This isn’t really about history. The past may be another country, but its inhabitants live among us. A Haunted Existence is at The Island until the 23rd September. More information here.